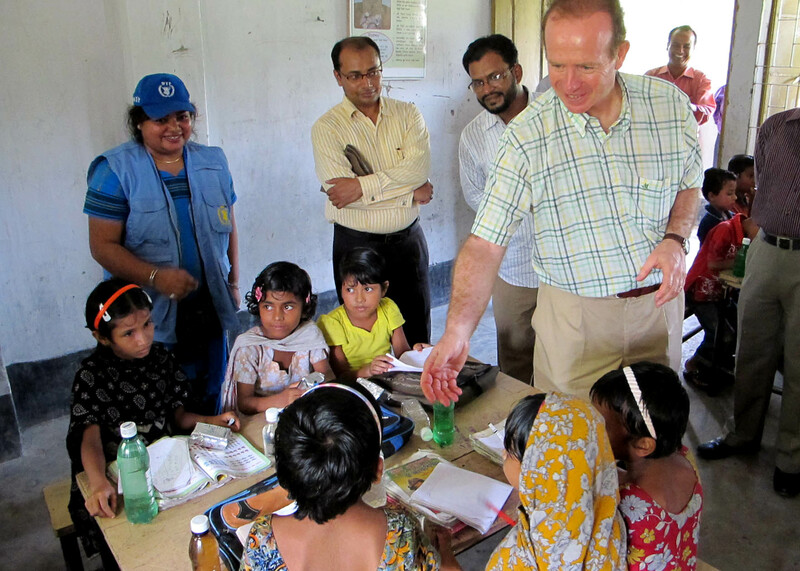 On 24-25 September 2011, the Ambassador of Spain to Bangladesh, H. E. Mr. Tajeda ChacÓn, visited a food security and nutrition project in Bhola District of Bangladesh which is being implemented by Muslim Aid with support from three UN agencies WFP, UNICEF and FAO. The project: ‘Protecting and Promoting Food Security and Nutrition for Families and Children in Bangladesh’ is funded by the Spanish Government under the MDG achievement fund. The Ambassador was accompanied by Ms. Crista Rader, Country Representatives, United Nations World Food Programme, Bangladesh; Mr. Toufiq Ahmed, The Head of Barisal Reason, UNICEF; Ms. Joyoti Dhingra, Coordinator of MDGF program; Mr. E I Zein EI Mozamil, Senior Emergency Coordinator UNFAO; Mr. Lutful kabir , Coordinator MDGF program of UNFAO; Mr. Mohammad Obaidur Rahman, Acting Country Director, Muslim Aid-UK, Bangladesh Field Office, Dhaka; Mr. SS Arefeen, The Head of Southern Office of WFP; Mr. Noor-E-Alam, The Upazila Nirbahi Officer of Charfession; Mr. Tanvir Elahi, Programme Manager, Food Security, Muslim Aid-UK, Bangladesh Field Office, Dhaka; Dr. Siddiqur Rahman, Upazila Health and Family Planning Officer of Charfession and Mr. Mozammel Haque, Upazila Family Planning Officer of Charfesson.